During Lent, a few women from Church of the Common Ground explored how the psalmists created their sacred poetry and learned to write some sacred verse of their own. Using Ray McGinnis’ Writing the Sacred: A Psalm-inspired Path to Appreciating and Writing Sacred Poetry, they walked through exercises exploring the psalms of creation, thanksgiving, lament, confession, wisdom, vows, as well as psalms for holding a vision. And, each week, they explored their own voices and their own sacred expression with God. They discovered along the way a new way of talking with God; they embraced new ways of hearing each other. God is life in all times. tall against the sunny afternoon. We shared stories about the struggles of life, the dangerous and hurtful experiences we have lived. We shared our stories of pain and suffering and mental illness. We remembered the human Jesus, the Jesus who walked on the earth just like us. And, because we know Jesus walked the earth as human just like us, we imagine he sometimes laughed and had fun, too. So, we ended our time together with our traditional silly photo. Thanks for visiting, Bishop Rob! Education – Featuring Panelists: Dr. Richard Dien Winield, Distinguished Research Professor, University of Georgia; Rev. Natosha Reid Rice, Associate Pastor, Ebenezer Baptist Church, and Associate General Counsel for Real Estate and Finance, Habitat for Humanity International; Dwayne Patterson, Director of Regional Organizing and Civic Engagement, Partnership for Southern Equity; and, Matthew Elder, Director of HomeFirst Gwinnett Initiative, United Way of Greater Atlanta; moderated by Elliot Watts, JD, of the CCG Advisory Council and Alston & Bird. They will lay bare the economic inequalities in Atlanta and beyond, outlining of the vast, inter-generational, and systemic wealth and income disparities that plague us. Action – We will make, and eat, sandwiches – the type often given to ‘the poor’ – building many for our partner ministries and agencies. And, we will have an interactive hour greeting and engaging CCG’s partners, ranging from housing and food provision and medical care, to criminal justice reform and race relations. What does God’s love look like? This Valentine’s Day we thought we would share some of the signs of God’s love that we see in our community all the time. 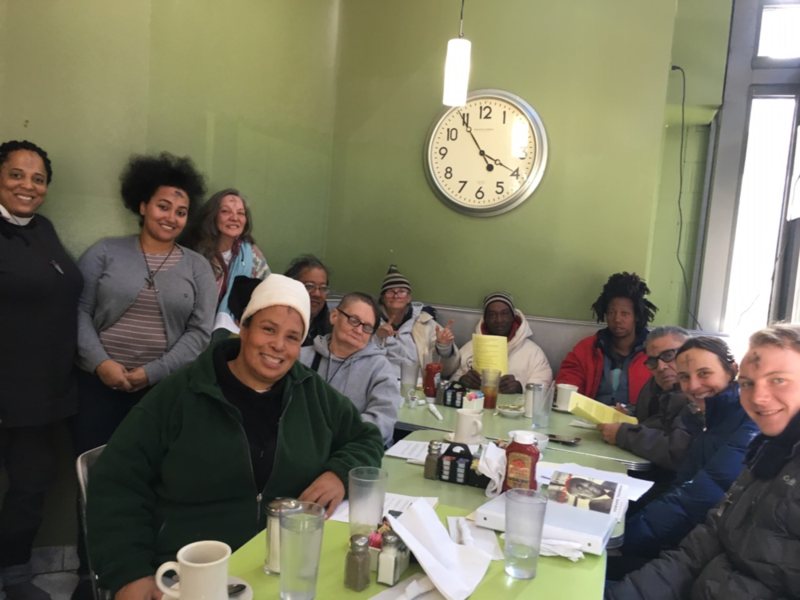 On the second Sunday of each month, Church of the Common Ground celebrates birthdays and our ongoing story as featured in our monthly newsletter. It was Super Bowl Sunday yesterday and, while many awaited a big sports game and trophies to follow, our Church of the Common Ground was handing out a different kind of symbol that Sunday afternoon. The first Sunday of each month, Common Ground hands out ecclesia cross necklaces to congregants, volunteers, clergy—all who experience ministry in and with outdoor churches a calling of the heart and soul. Teams around the world huddle every Sunday, in football season and even when it’s not football season, to answer God’s call to be spiritual athletes. These teams hold hands; they pray together; they focus together on how to help each other reach God’s goal line…love, kindness, compassion, community. Church of the Common Ground is filled with spiritual athletes who know that being an athlete means sometimes facing challenges. This Super Bowl weekend our spiritual athletes may face more challenges than usual. Recently, WABE published a story about homelessness and Super Bowl weekend featuring our community. You can listen to it at the link below. As community, as a team, our spiritual athletes will again join hands at 1:00pm on Super Bowl Sunday. We will huddle up and offer up to God our hopes and prayers…that we will all learn to love each other as God has loved us. An offering from our partners in ministry to guide you this Advent. Click here to see an advent devotional from Mercy Church. Check out all that has been happening at Church of the Common Ground by taking a few minutes to read our latest newsletter! At the Cathedral of St. Philip last Thursday night, the annual Homeless Requiem honoring those who have died on our city streets was attended by many, including members of Church of the Common Ground. When the baskets came round for a collection, a young woman in our community lifted her hand in one seamless and confident gesture and placed into the basket her nickel. Her head was raised and the expression on her face radiated the power of community living the Gospel: love one another. At Church of the Common Ground we talk a lot about the ways in which we are called by God to love each other. We talk about a community of God’s love that knows the first way to show our love to God’s world is to show up. We show up at the Homeless Requiem at the Cathedral of St. Philip and are chalice bearers or readers. We show up with St. Anne’s to build a Habitat Home each year. We show up at Common Soles every week to wash and nurture the feet of our brothers and sisters on the streets. We show up learning about the labyrinth with our friends at St. Veronica’s guild. We show up at Theology from the Margins to talk about God and learn more about the ways of God in this world. We show up and give, not two copper coins, but one silver nickel and rejoice that God is smiling because of our gift given freely. We live our truth that two copper coins are sometimes really two loving hands ready to embrace the world with love. But, being a community of love on the streets isn’t always easy. At Church of the Common Ground it takes coffee, creamer and sugar for hospitality before Morning Prayer. It takes bottled water for Bible Study ensuring that our community has clean and healthy water available. It takes paper to print bulletins for Sunday worship and newsletters to share the story of community. It takes a van to transport our altar for worship, our folding chairs and ecclesia cross for Morning Prayer, our cooler and water for Bible study, our reading glasses for all of our community who struggle with reading their Bibles due to poor eyesight. It takes two copper coins given again and again by people near and far to help sustain the message: We are all God’s beloved. So, today and this week we come to you asking for help. This is our time for appeal to help us plan the future of this church into 2019 and beyond. To make a donation, just click here and choose Church of the Common Ground from the donation list. If you are unable to make a financial contribution at this time, then please commit to prayer for our community. Next Sunday when the Gospel of Mark will ask us all to reflect on the widow and her two copper coins, we invite you to celebrate what we are calling Common Gifts Sunday. 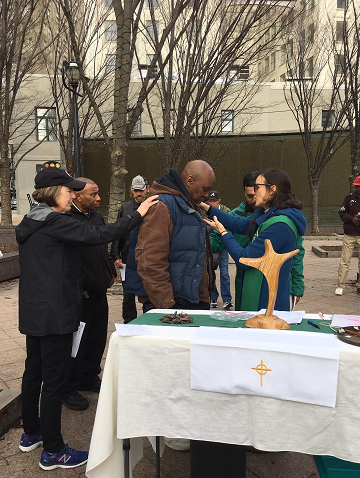 During our worship service at 1pm in Woodruff Park, we will bring to the altar all of the contributions, donations and pledges we have received from parishes and individuals. We will bring to the altar the offering cards of our own community where they will affirm the time and talents they will dedicate to being a community of God’s love on our city streets. It will be a celebration of hope and love not to be missed. So, please join us and, if you are able, please give. Imagine a space where each week a group of people gather to talk about sections of the Bible and learn about God’s way in the world. Imagine that this weekly gathering of people and hearts happens in the middle of a city park under trees and skies and happens no matter what the weather is doing outside. Imagine that this group has braved unbearable heat, wind, and even a tornado once, to be together and talk about God. Hold onto that picture in your mind and heart, for it is the picture of Bible study at Church of the Common Ground. For many years now a dedicated community of believers have huddled together and reflected on scripture. We have shared ideas; we have challenged each other’s assumptions. And, through it all, we have laughed, cried, pondered, consoled and encouraged each other on our respective journeys with God. We open scripture to open our hearts every Wednesday in Woodruff Park. Opening their hearts to make Bible study special have been our friends at Church of Our Saviour. Their dedicated ministry provides sandwiches each week to help us study God’s Word. And, when the weather proves to be more than the hardiest spirit can handle, our friends at Landmark Diner have sheltered us from the elements. We are so grateful to them both! Bible study is a special time of prayer and community for Church of the Common Ground. All are welcome, so please join us any Wednesday at 2:30pm in Woodruff Park. Housed or unhoused, the deep yearning for quiet times in which we can feel the presence and peace of our loving God is universal to humanity. For the community of Church of the Common Ground, that time is nurtured every Monday and Wednesday at Morning Prayer. God’s love is shared in a cup of coffee and a smile. The fellowship of God’s spirit is extended among friends joining in conversation with laughter, thoughtfulness, and, sometimes, in the fullness of sorrow. The deep healing of God’s stillness is then given room on the busy streets of downtown Atlanta. A circle of chairs and a wooden ecclesia cross create a common center of welcoming. Then the gong rings and prayer and the stillness of God’s love permeates all. Only God could help us create a circle of such prayer that drowns out cars, sirens, and occasional shouting. It is still and deep God time and space. Our beautiful friends at Central Presbyterian Church and Central Outreach open their hearts and courtyard gates to provide a space for our prayer time each week. We are so grateful to them. Thank you! We invite you to join us for Morning Prayer any Monday or Wednesday morning in the courtyard at 10:30am. Contact the vicar at vicar@churchofthecommonground.org for more information. In the weeks ahead, you will be hearing of ways that you can help Church of the Common Ground continue to be a beacon for God’s love on our city streets. 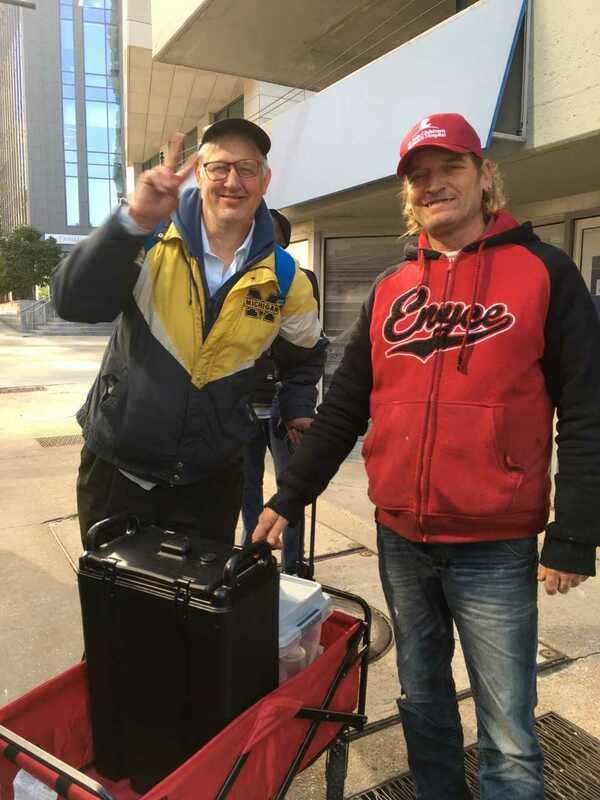 Our annual appeal process is underway and we will ask those who are able to help us share God’s presence one sidewalk, block, city park and street at a time. Stay tuned. "Volunteering is a form of holy worship"
“Volunteering at CCG is a form of holy worship for me. I love my time there because I can see the face of Jesus in the men and women we serve and feel God’s grace and love surrounding us. Foot clinic provides the opportunity to help comfort clients who may rarely feel the touch of another person. To be part of this experience and see that what we do transforms both their feet and attitude is very rewarding. I feel like there is an open channel of love and emotion that flows between all the people of CCG and God is in the water! We cannot do what we do alone. If you are interested in volunteering at any of our programs, please just send us a note at vicar@churchofthecommonground.org.